The Pythagorean Theorem states that if a right triangle has side lengths and , where is the hypotenuse, then the sum of the squares of the two shorter lengths is equal to the square of the length of the hypotenuse. Figure 1 – A right triangle with side lengths a, b and c.
For example, if a right triangle has side lengths and , then the length of its hypotenuse is , since . Exercise 1: What is the hypotenuse of the triangle with sides and ? The converse of the theorem is also true. If the side lengths of the triangle satisfy the equation , then the triangle is right. For instance, a triangle with side lengths satisfies the equation , therefore, it is a right triangle. Geometrically, the Pythagorean theorem states that in a right triangle with sides and where is the hypotenuse, if three squares are constructed whose one of the sides are the sides of the triangle as shown in Figure 2, then the area of the two smaller squares when added equals the area of the largest square. 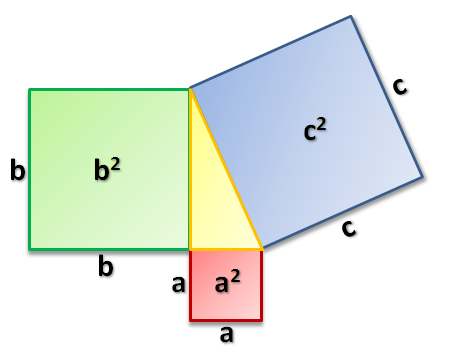 Figure 2 – The geometric interpretation of the Pythagorean theorem states that the area of the green square plus the area of the red square is equal to the area of the blue square. 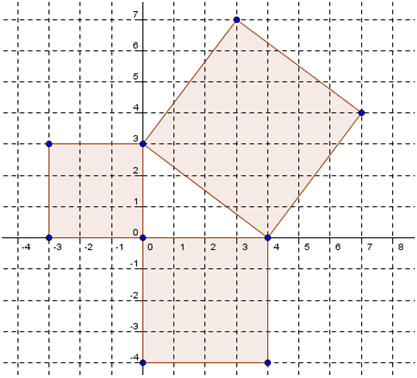 One specific case is shown in Figure 3: the areas of the two smaller squares are and square units, and the area of the largest square is square units. Exercise 2: Verify that the area of the largest square in Figure 3 is 25 square units by using the unit squares. Figure 3 – A right triangle with side lengths 3, 4 and 5. Similarly, triangles with side lengths and are right triangles. If the side lengths of a right triangle are all integers, we call them Pythagorean triples. Hence, and are Pythagorean triples. Exercise 3: Give other examples of Pythagorean triples. Exercise 4: Prove that there are infinitely many Pythagorean triples. There are more than 300 proofs of the Pythagorean theorem. More than 70 proofs are shown in tje Cut-The-Knot website. Shown below are two of the proofs. Note that in proving the Pythagorean theorem, we want to show that for any right triangle with hypotenuse , and sides , and , the following relationship holds: . First, we draw a triangle with side lengths and as shown in Figure 1. Next, we create 4 triangles identical to it and using the triangles form a square with side lengths as shown in Figure 4-A. Notice that the area of the white square in Figure 4-A is . 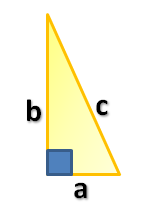 Figure 4 – The Geometric proof of the Pythagorean theorem. 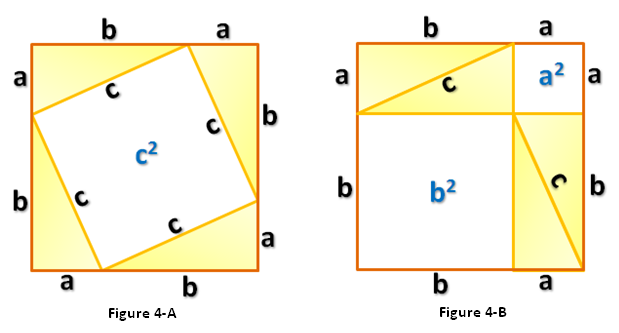 Rearranging the triangles, we can also form another square with the same side length as shown in Figure 4-B.This means that the area of the white square in the Figure 4-A is equal to the sum of the areas of the white squares in Figure 4-B (Why?). That is, which is exactly what we want to show. *And since we can always form a (big) square using four right triangles with any dimension (in higher mathematics, we say that we can choose arbitrary and as side lengths of a right triangle), this implies that the equation stated above is always true regardless of the size of the triangle. Exercise 5: Prove that the quadrilateral with side length C in Figure 4-A is a square. which is exactly what we want to show.